Posted on Aug. 16, 2014, at 3:43 p.m.
MONROVIA, Liberia — This morning Makasha Kroma shivered with fever. Her head still hurt; that hadn’t gone away. And she was vomiting a lot. Kroma came to the West Point holding center with her sister, her three children, a cousin named Bindu, and two other family members. They are all women, or girls — most caregivers in Liberia are — and they washed Kroma’s clothes, fed her rice, wiped down her body, and cleaned up her vomit with a rag and some chlorine. Two escaped by climbing the back wall, according to health care workers in a clinic next door. Another, a woman with five children, simply took off, Tarplah said. West Point is becoming a hot spot in a hot spot in the biggest Ebola outbreak in history. It’s an informal community, a “slum,” with no running water or toilets. A mob descended on the center at around 5:30 p.m., chanting, “No Ebola in West Point! No Ebola in West Point!” They stormed the front gate and pushed into the holding center. They stole the few gloves someone had donated this morning, and the chlorine sprayers used to disinfect the bodies of those who die here, all the while hollering that Ebola is a hoax. Now nobody knows where she, or the dying Kroma, has gone. Tolbert Nyenswah, the assistant minister of health, told BuzzFeed on Thursday they intend to quarantine all of West Point, a serious measure that would require meticulous planning and heavy security. Things are become more and more deadly in this world of the insane globalists! Those poor folks in Africa---my heart goes out to them: as the Killer Nazis' tell them there is NO CURE: and all the while TWO Americans are in the USA and doing better? I couldn't agree more. Race specific bio-weapons is what these evil rat bastards have had on the agenda for a long time. I say we beef up our immune systems folks. Get healthy now, and get right with God! I bet donnay can add to the list! Liberia's armed forces have reportedly been given orders to shoot people trying to illegally cross the border from neighbouring Sierra Leone, which was closed to stem the spread of Ebola. Soldiers stationed in Bomi and Grand Cape Mount counties, which border Sierra Leone, were to "shoot on sight" any person trying to cross the border, said deputy chief of staff, Colonel Eric Dennis, according to local newspaper the Daily Observer. The order comes after border officials reported people continued to cross the porous border illegally. Grand Cape Mount county had 35 known "illegal entry points," according to immigration commander Colonel Samuel Mulbah. Illegal crossings were a major health threat, said Mulbah, "because we don't know the health status of those who cross at night". Liberia closed its borders with Sierra Leone weeks ago in an attempt to contain the Ebola outbreak, which killed more than 1100 people in west Africa. 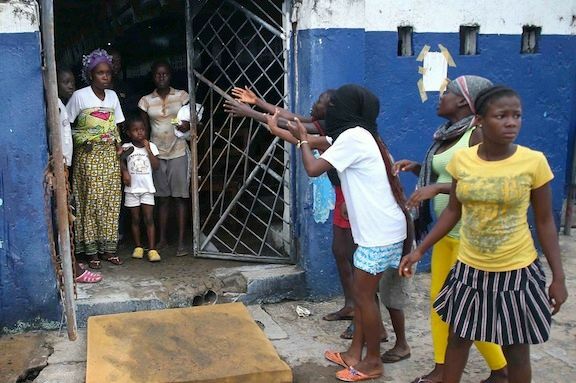 The announcement came after residents of a slum near the capital broke into an isolation centre and freed up to 30 Ebola patients, local newspaper Front Page Africa reported. "As I speak the police station is deserted. There is no security now in West Point," resident Moses Teah was quoted as saying. The break-in to protest poor conditions at Ebola quarantine centres has raised fears that the deadly virus will spread in the slum. The World Health Organisation (WHO) has said that a "massive scaling up of the international response" is necessary to get the outbreak under control. intimidate … and enforce the open-air PRISON PLANET! Well! Do you think the truth is in front of you? is Ebola : Man Made? I say : "YES!" The Blood is what this is all about! is it not true that this mad made illness is spreading world wide? Your call---and PLEASE WASH YOUR HANDS!!! I do not think it is man made. Because all Bio-Weapons are not control able. They are Total Control Phreaks. I also believe this Ebola is Man Made: Just as AIDS is Man Made! These Mad Scientists will continue creating Bio-Weapons until their goal is reached: which is a 90% depopulation on the Human Race. I also think when the GOONS start calling for a World Wide Vaccine---Then the real Killing begins on a Global scale! (Reuters) - The Ebola crisis is forcing the American healthcare system to consider the previously unthinkable: withholding some medical interventions because they are too dangerous to doctors and nurses and unlikely to help a patient. Officials from at least three hospital systems interviewed by Reuters said they were considering whether to withhold individual procedures or leave it up to individual doctors to determine whether an intervention would be performed. "The CDC and the Hospitals are all full of BS!" ...and that is a quote from Real RN's who know the truth! Real Nurses do not ride a bike with a contaminate, down a street to infect people: Unless this Ebola Scare is all for a new Vaccine! Side Note: "Ebola is Man Made from Eboli! Look in to it... "
Ebola - Has it come back ? I ask because stories are appearing of a new outbreak of Ebola. 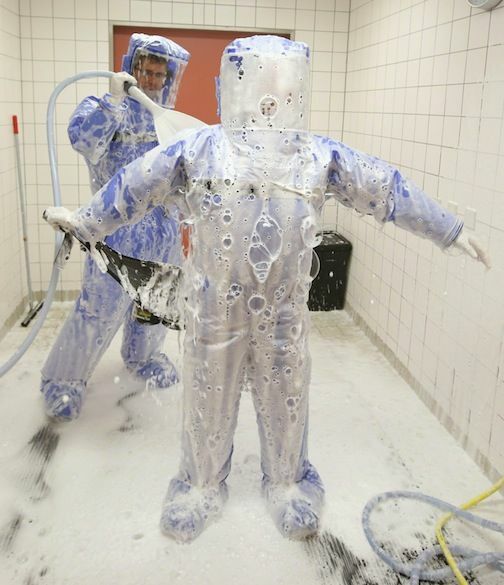 'Health officials seem intent on letting Ebola loose once again. This is yet another dark sign of the intentional assault on our cultural immune system and disease-resistance which was acquired through a century of hard work and common sense immigration policies which, as you well know, has all but been completely abandoned. These once intelligent policies gave us the healthiest standard of living on the planet but because of the zionist, communist Bolshevik plans to destroy Western Christian-based civilization, we are rapidly falling into Third World status. It is all, as you well know, being done with full deliberation and the tacit and active approval of all three branches of the US government. We have been invaded, penetrated and betrayed. Those are the facts. Spam_A Spam_B Think of all the diseases that have been intentionally allowed into America…from the new, super-deadly Chagas disease to XDR TB to Leprosy and dozens more, the assault on our country is catastrophic. And not a single word, let alone a tweet, from the zionist tool in the White House. 'The second biggest Ebola outbreak in history is going on the in the Democratic Republic of Congo right now. It’s second only to the 2014 outbreak that infected nearly thirty thousand people and killed more than 11,000. And now, it may be here in America. An American healthcare worker was exposed to the virus while treating patients in the DRC. The worker, whose name has not been released, flew back to the United States on Saturday and was put into quarantine for up to two weeks at the University of Nebraska Medical Center (UNMC) in Omaha. A few things that are important to note here. The healthcare worker has not tested positive for Ebola, nor is the person showing any symptoms. If the worker develops Ebola, it still doesn’t mean that he or she would have made fellow travelers sick. Ebola is not contagious until symptoms are exhibited, so if it’s true that there were no symptoms when the person was admitted to the UNMC, then it’s unlikely that the virus was passed on to others. The current outbreak in the DRC could easily get out of the country because it’s spread to cities that are major transportation hubs to the rest of the world. There are other variables that are also making it difficult to contain. Its just a matter of time before it goes on the rampage. Honestly, in the developed world the bigger threat would be panic . . . but imagine the level of panic in developed countries whose food supply is "just in time" and other instances of fragility. Be afraid.